Raise the bar with Debossed's fun-loving, extroverted twin! 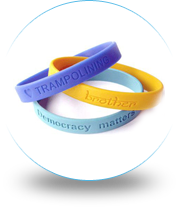 Always looking to stand out and get attention, the Embossed Wristbands are customized with heightened font to display your message above all the rest. Embossed Rubber Bracelets feature raised text and artwork as opposed to Debossed’s standard “sunken in” text. Embossed band sales are on the rise due to their exceptional ability to make your personalized statement pop! 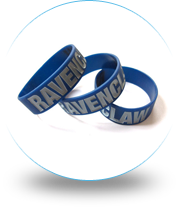 Embossed wristbands and bracelets are created opposite of their sister bracelet, the classic Ink-Filled Wristbands, so your detailed design protrudes out of the rubber bracelet. A cast-iron mold with your customizations is used to develop your exclusive concept which demonstrates an elevated graphic effect. When you are thinking outside the box, choose the style that is outside the band - Embossed. 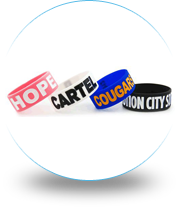 Sporting an embossed wristbands is a great way to bring attention to your passion project and embossed bracelets help you market your interests accordingly. 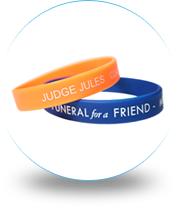 Propel awareness and boost recognition for your cause or event by ordering custom embossed wristbands with YOUR personalized, unique message or slogan. 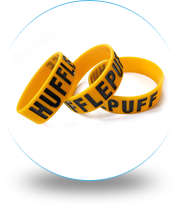 Make Your Wristbands use only the best materials and guarantee your bands will meet your expectations. 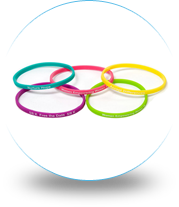 We offer 100% non-allergenic silicone wristbands in an array of Make Your Wristbands products, we can get your order started with just a minimum of 50 wristbands! 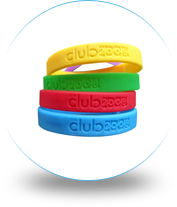 Whether you need a wristband that will fit an adult, or smaller sizes to fit children, our friendly sales reps are waiting to assist you with getting your embossed wristbands exactly the way you want them. Stand up. Stand out. Order your embossed bands today and be set apart from the crowd! Free Shipping! Free Artwork! Free Setup! Free Proof!